During this cleanse, you will be focusing on the foods that heal and nurture your body. Everything we eat either promotes health or disease. When your body gets what it actually needs, your body will rid itself of harmful toxins, find balance (even combat unhealthful cravings), repair and heal. 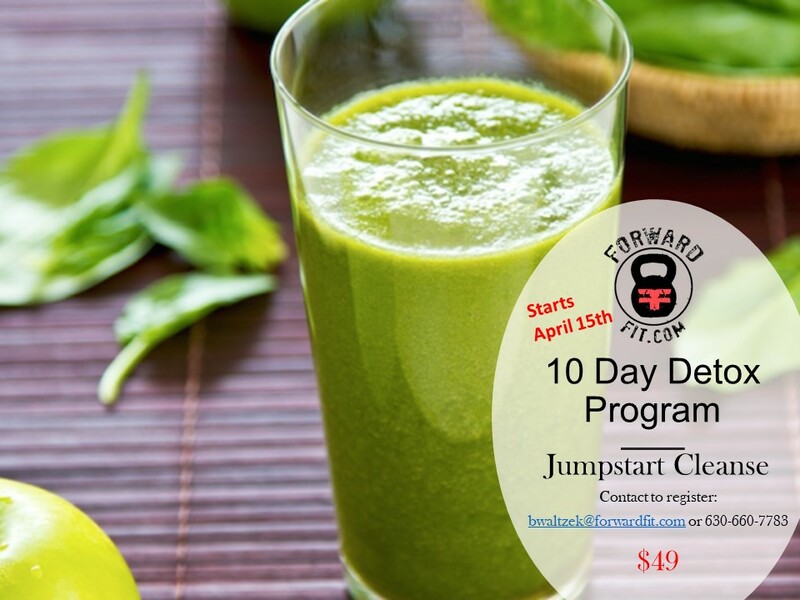 The program outlines the guidelines and intentions you will make within the 10 days along with recipes and the items you need to get through this program. There are over 25 great recipes! Each morning I will be sending you motivational emails and information to keep you going throughout this program. Hot lemon water, Veggies (LOTS OF VEGGIES), Fruits, Juices (from juicing or smoothie blending), soups (homemade), whole grains like buckwheat, quinoa, brown rice, legumes, nuts and seeds. Call 630-660-7783 or email Bill at bwaltzek@forwardfit.com with any questions.